Tag Archives: Heaven’s Doors: Wider Than You Ever Believed! 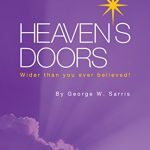 jasBooksGeorge Sarris, Heaven's Doors: Wider Than You Ever Believed! New book by George W. Sarris, author, speaker and performer.